Fables (apologues) and parables are short allegories. A. Fables are written for the moral. 1. A fable, or apologue, differs from a tale, in that it is written expressly for the sake of the moral. 2. If there is no moral, there is no fable. B. The characters in fable speak and act as monitors to mankind. 1. They are often personified inanimate objects or personified lower animals. 2. 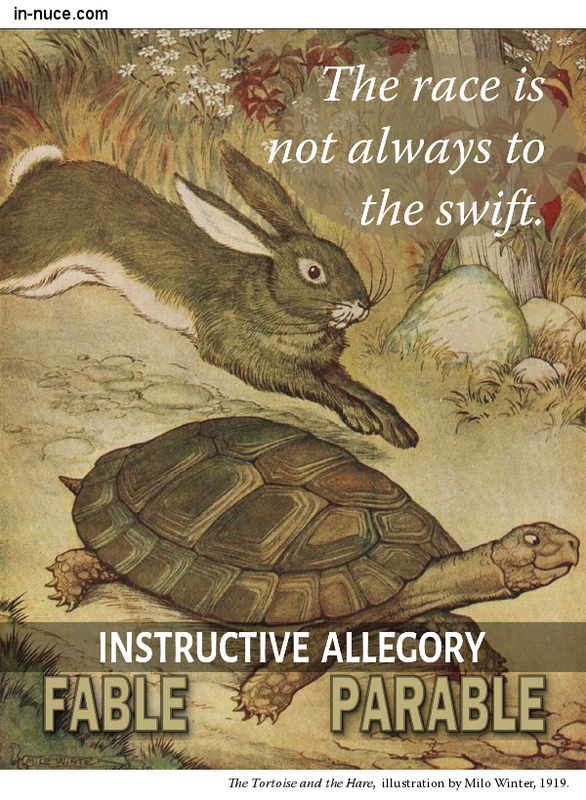 Fable attributes the actions and words of rational beings to what is inanimate and irrational. 3. The characters are purely fictitious—brutes and plants are made to think, and speak, and act like men. 4. When human beings are used as characters in fables they symbolize all of their class or kind. C. A fable must be short. 1. If a moral truth is to shine through a fable, the whole of it must be quickly made apparent. 2. It is with a view to brevity that the fabulist makes use of animals of known character. 3. The reader recognizes the characteristics the instant the animal is mentioned, and the author thereby avoids the necessity of longer description. For example, the characters of a fable might be foxes used to symbolize crafty men. A. A parable illustrates some truth. Though fictitious, they are drawn from realistic events and characters, and are therefore supported by probability and easily applied to life situations. B. Reformers and teachers of all times have made much use of them. 1. By means of parables, abstract truths can be presented in graphic form so that they can be easily understood. Though true examples from history are “of greater effect in deliberation and more appropriate to persuasive oratory,” Aristotle in his Rhetoric tells us that fables and parables are often useful. Seventeenth Century French poet known for his Fables.